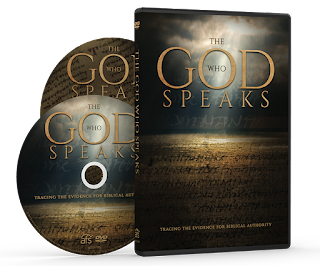 I’ve just been alerted to the release of a new Bible documentary for Christians called The God Who Speaks. The contributors are (with one exception?) American-based Evangelical scholars, apologists, or pastors. You can buy the DVD at the website or stream it for free if you have Amazon Prime. I haven’t watched it myself, but, from the trailer, it looks like it gives attention to the text’s transmission. (Note that Dan Wallace, Mike Kruger, and Karen Jobes are contributors.) If any readers have seen it, let us know in the comments. And happy new year! Time for another round of everyone’s favorite game, “Who Said It?” No using Google, although in this case it won’t help you anyway. Since the Textus Receptus was overcome by the scholarly textual criticism of the 19th century, there is tenacious negative bias against the Byzantine majority text. Wherever well-known, older textual witnesses like Vaticanus and Sinaiticus, and even more so in combination with a papyrus, stand against the majority of minuscules, the decision against the majority text was often made easily, without seriously considering the quality of the variants in question. One hint: it is not Maurice Robinson. Update: Peter Montoro was correct. This is from Klaus Wachtel in the introduction to Part 1.1 of the ECM III on Acts (p. 30*). This year, the ETC blog has been humming, publishing more posts than in any single year since 2010. 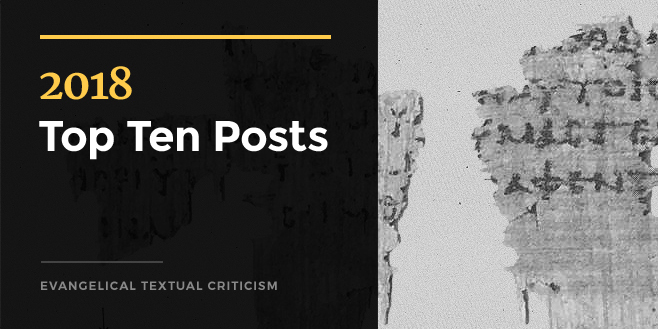 We even had legit posts on Old Testament textual criticism thanks to John! We want to say thanks to all who read, comment, email, and follow on social media. At the end of the year I like to look back and see what was most read. Far and away, the top spot belonged to our new contributor, Elijah economical-with-the-truth Hixson, announcing the publication of the not-first-century-but-still-the-earliest fragment of Mark. 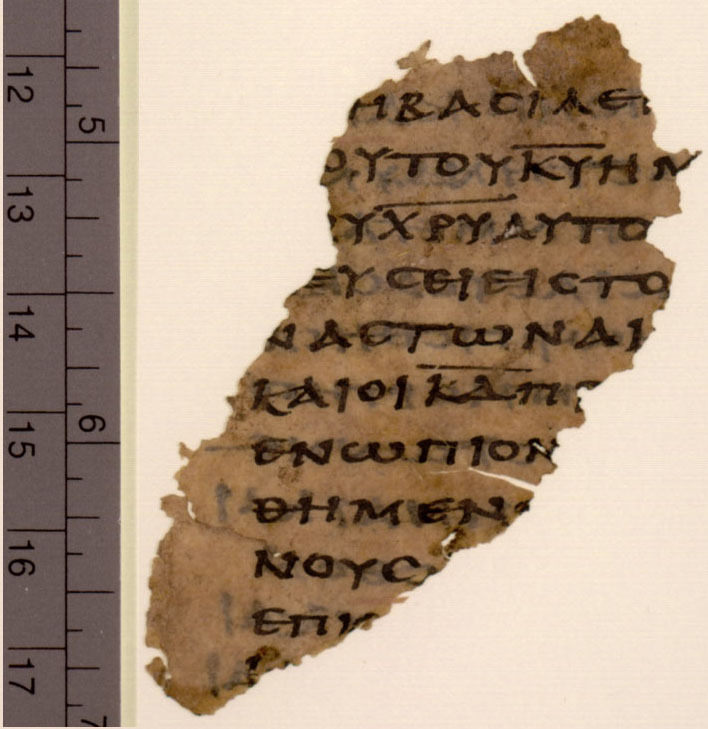 Beyond this reMarkable fragment, it seems that translation news remains a topic of interest as does apologetics. Here is the full top ten list. ... in some cases, the Byzantine text goes back to a single exemplar that is not the autograph and not in agreement with our earliest extant Greek witnesses. These two cases also illustrate well the reality that no single text-type or manuscript has a corner on the original text all the time. In other words, why I’m a reasoned eclectic. 2 καὶ οἱ στρατιῶται πλέξαντες στέφανον ἐξ ἀκανθῶν ἐπέθηκαν αὐτοῦ τῇ κεφαλῇ καὶ ἱμάτιον πορφυροῦν περιέβαλον αὐτὸν 3 καὶ ἤρχοντο πρὸς αὐτὸν καὶ ἔλεγον· χαῖρε ὁ βασιλεὺς τῶν Ἰουδαίων· καὶ ἐδίδοσαν αὐτῷ ῥαπίσματα. 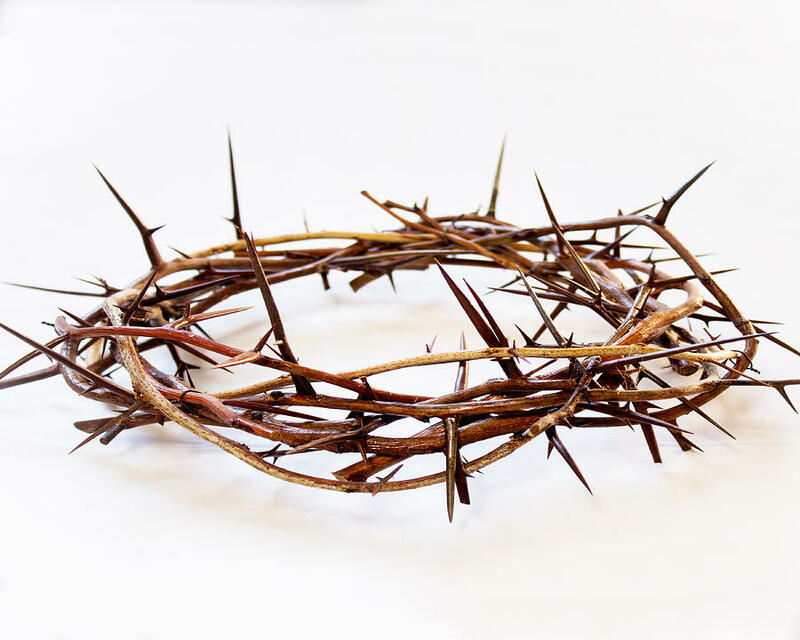 2 And the soldiers twisted together a crown of thorns and put it on his head and clothed him in a purple robe. 3 And they were coming to him, saying, “Hail, King of the Jews!” and struck him with their hands. Unlike in the 1 John examples, here there is early support for the majority reading (A f q syp). But like those cases, the obvious explanation for the shorter reading is still omission caused by parablepsis (involving αὐτόν). The significance, again, is that we have here a shorter reading in the majority of manuscripts that goes back earlier but is still not likely to be original. And so, with apologies to MAR, it is yet one more reason why I am not a Byzantine prioritist. The current volume 23 (2018) of TC: A Journal of Biblical Textual Criticism is now complete with six fine articles and nine reviews, linked below. The journal is flourishing, and some good things will happen next year. Many further articles and reviews are already in the pipeline. As one of the editors I would like to welcome your submissions! Abstract: Focusing on the work and life of H. C. Hoskier, this article explores the broader intellectual context of late nineteenth and early twentieth century textual criticism. 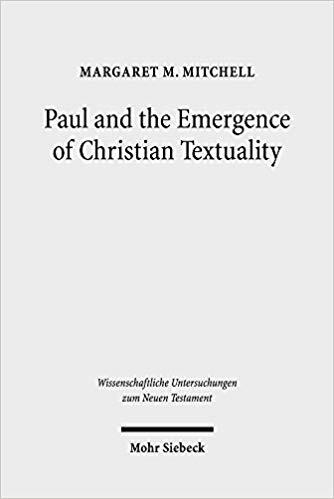 This examination illuminates the deep context of current trends in textual scholarship on the New Testament, arguing that the discipline has much to learn from the dark corners of the tradition. Abstract: Till today Rahlfs’s edition from 1931 is the standard text when it comes to the Greek Psalter. However, important discoveries were made after 1931, for example the Psalm scrolls from Qumran and early Greek manuscripts. This article includes the new material and argues that the original text of the Septuagint has been a freer translation than the text reconstructed by Rahlfs. It also shows that the new Greek manuscript findings of Papyrus Bodmer XXIV (Ra 2110) and Oxyrhynchus Papyrus 5101 (Ra 2227) attest to a particularly strongly Hebraized text-form. Abstract: In this article, I am concerned with the various delimitation markers found in Codex Vaticanus. While some scholars have assumed an overall coherence between these markers, I argue that they must first be examined on their own to determine their function and relation to one another. This is done first by understanding textual delimitation as a part of transmission and scribal habit. After examining the spacing, ektheses, paragraphoi, and Greek section numerals, I conclude: (1) only the spacing and ektheses are original to the work of the scribes; (2) the paragraphoi were later additions for the purpose of reading, and sometimes correct the original divisions of the scribes; and (3) finally, the later additions of Greek section numerals were for ease of reference and can both agree and disagree with previous division markers. The data presented below has implications for any further conclusions about the purpose and relationship of these divisions to the larger textual tradition. Abstract: This paper contributes to a developing conversation about the New Testament canon. I consider the way manuscripts combine different works and investigate to what extent, even before canon lists became widespread, manuscripts combined only those works that were later affirmed as canonical. My method is to establish the works contained in all Greek New Testament manuscripts, dating from before the end of the fourth century. There are a number of cases where only a fragment survives, containing a small part of one work, but where there are also page numbers that enable us to estimate what else might have been present. My results demonstrate that the works that are now considered canonical were rarely combined with works now considered noncanonical. However, they also demonstrate that single-work manuscripts were widespread. Abstract: Since their discovery, scholars have known about the close textual relationship between two sixth-century Greek codices of the Gospels. That Codex Purpureus Petropolitanus (N 022) and the Rossano Gospels (Σ 042) were copied from the same exemplar is rarely questioned. However, both manuscripts also feature primary and secondary corrections. Based on the ink, pen nib width, scribal hand and textual affinity of the corrections, as well as some similar mistakes elsewhere in the manuscripts, it seems that the same scribe corrected both manuscripts using the same second exemplar. Specifically, the scribe of 042 was responsible for secondary corrections in both 042 and 022, and the second exemplar to which the corrections were made might have been a close textual relative to another sixth-century purple codex, Codex Beratinus-1 (Φ 043). Abstract: The scribal habits in 𝕻127 confirm James R. Royse’s findings that early New Testament scribes omit more than they add. Although 𝕻127 reflects more omissions than additions, the scribe’s habits are nevertheless strikingly different than Royse’s scribes. Royse also wonders if scribal conventions may have changed, becoming more fixed in post-Constantine Christianity. Such a question would require an investigation of many later manuscripts. 𝕻127, however, does not represent a fixed, more stable text. Rather, the opposite is true: 𝕻127 displays a high degree of textual variance. More studies of this type are needed to determine if 𝕻127 is indicative of the fifth century or if other fifth-century witnesses exhibit textual fixity. We all know one of the best things about the annual SBL conference is the bookstalls. You get a chance to sample the latest and greatest offerings from the major publishers. Even though I try to keep my eye on new publications I inevitably see things there I had missed. This year I came across three books I hadn’t been aware of that looked pertinent to TC. Please note that I haven’t read these. But let me know if you have and what you think. Judaism and Christianity both arose in times of empire, with roots in Persian, Hellenistic, and Roman periods. In order to understand these religious movements, we must first understand the history and society of these imperial cultures. In these formative years, wisdom and apocalyptic traditions flourished as two significant religious forms. 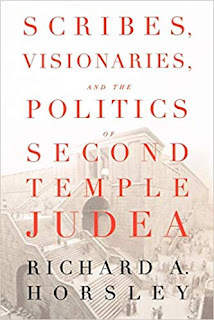 In Scribes, Visionaries, and the Politics of Second Temple Judea, distinguished New Testament scholar Richard A. Horsley analyzes the function and meaning of these religious movements within their social context, providing essential background for the development of early Judaism and early Christianity. 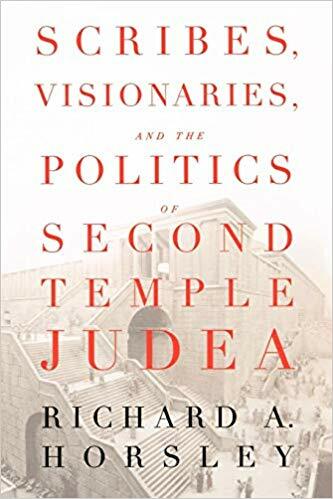 It is an ideal textbook for classes on the rise of Judaism or the Second Temple period, as well as the Dead Sea Scrolls and Apocrypha. Most of this book is about cultural and sociological background, but there are three chapters in particular on scribes, orality, and writing etc. The apostle Paul was the inaugurator of early Christian literary culture, not only through the writing of his own letters (ca. 50–62 CE)—which were to become surprisingly influential once collected and published after his death—but also through the successful propagation of a religious logic of mediated epiphanies of Christ, on the one hand, and of “synecdochical hermeneutics” of the gospel narrative about Christ, on the other. He set the precedent that the Christ-believing movements were to be rooted in texts and textual interpretation. Already in his own letters, Paul began a process of ongoing articulation and reinterpretation of the gospel narrative and the various means by which it could be replicated in each new generation and locale. This process was to continue through the letters written in his name, the Acts of the Apostles, and apostolic imitators and expositors in the centuries to come. 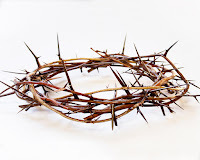 These 15 essays by Margaret M. Mitchell are accompanied by an introduction that lays out thirteen propositions for the development of early Christian literary culture from its inception in the astounding claims of Paul, the self-styled “apostolic envoy of Jesus Christ crucified,” up through Constantine. What little I have read of Margaret Mitchell’s work tells me I should be reading much more. Here is a collection of her essays over the years, so probably a good place for me to start. At the end of several of his letters the apostle Paul claims to be penning a summary and farewell greeting in his own hand: 1 Corinthians, Galatians, Philemon, cf. Colossians, 2 Thessalonians. Paul’s claims raise some interesting questions about his letter-writing practices. Did he write any complete letters himself, or did he always dictate to a scribe? How much did his scribes contribute to the composition of his letters? Did Paul make the effort to proofread and correct what he had dictated? What was the purpose of Paul’s autographic subscriptions? What was Paul’s purpose in calling attention to their autographic nature? Why did Paul write in large letters in the subscription of his letter to the Galatians? Why did he call attention to this peculiarity of his handwriting? 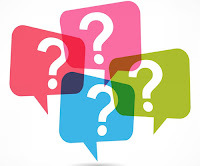 A good source of answers to these questions can be found among the primary documents that have survived from around the time of Paul, a large number of which have been discovered over the past two centuries and in fact continue to be discovered to this day. From around the time of Paul there are extant several dozen letters from the caves and refuges in the desert of eastern Judaea (in Hebrew, Aramaic, Nabataean, Greek, and Latin), several hundred from the remains of a Roman military camp in Vindolanda in northern England (in Latin), and several thousand from the sands of Middle and Upper Egypt (in Greek, Latin, and Egyptian Demotic). 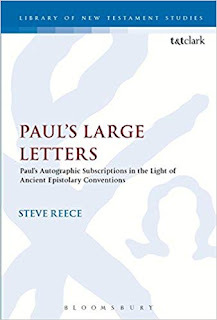 Reece has examined almost all these documents, many of them unpublished and rarely read, with special attention to their handwriting styles, in order to shed some light on these technical aspects of Paul’s letter-writing conventions. I texted Pete Head, expert in all things Pauline and epistolary, at SBL about this one and he said it was quite good. (Correct me if I’m wrong, Pete.) 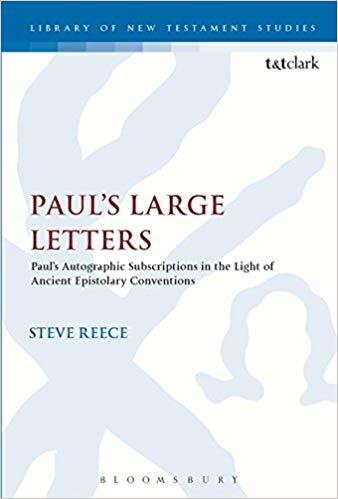 You can also read an in-depth interview with Reece, complete with his reconstruction of Paul’s original letter to the Galatians. Most scholars who employ manuscripts in their research tend to focus on the literary content itself. But what about the role of the scribe who typically remains at the periphery of research? How can we, in the words of the NT textual critic James Royse, “virtually look over the scribe’s shoulder” to understand the process by which our manuscripts were produced. The aim of this workshop is to bring together scholars from various disciplines to study the individuals who produced our manuscripts and how they shaped the transmission of literary texts they copied. Topics may include:The qualities, habits and skills of the scribe. Typology of changes made by scribes . The visual features of the MSS as produced by scribes. How can scribal habits help us reconstruct texts? Why do scribes deviate from their exemplars? How are peculiar readings produced? What does the scribe do when (s)he spots an error? What is the right spelling of a word and how are orthographic variants produced? Is it time for a new paragraph? Second-hand scribes (e.g. vocalizers, dotters, and commentators). This workshop will focus on Middle Eastern manuscripts written in Hebrew, Syriac, Arabic, Persian, Armenian, Coptic and other languages. Scholars interested in participating may send via email a proposal between 750 and 1,000 words. Proposals are to focus on the scribe and scribal habits (i.e. not a study of the literary text itself). Comparative analyses across traditions is encouraged but not required. Submission deadline is January 15, 2019. Submissions are to be sent via email directly to George A. Kiraz at gkiraz@ias.edu. 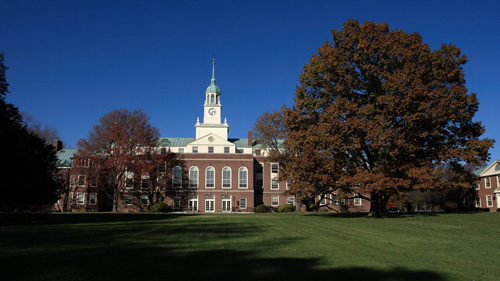 Scholars are expected to fund their travel to/from and accommodation in Princeton. The Institute will provide meals and a conference celebratory dinner. Speakers will be invited to contribute to a collected volume on an agreed-upon theme. As time allows (and it doesn’t allow much these days), I continue to be interested in how theologians in the Reformation period and after dealt with the problems of textual criticism. 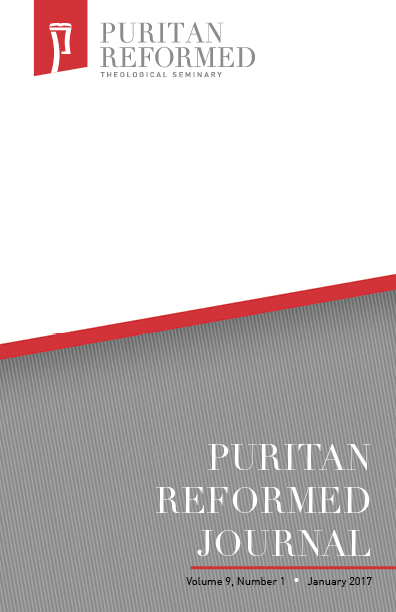 Lately, that interest has taken me to historian Garnet Milne’s self-published book on the Westminster Confession and the doctrine of preservation. 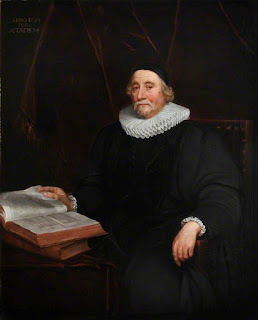 This book, which I may say more about another time, pointed me to a relevant portion of James Ussher’s famous Body of Divinity, a book originally published in 1649. Ussher (1581–1656) may be best known today for his dating of creation, but he was far more than a chronologist. He is said, among other things, to have been a strong influence on the Westminster divines. It is in that role that he is sometimes cited in an effort to clarify what those divines meant in the Westminster Confession when they said that the Greek and Hebrew are “authentical” because they have been “kept pure in all ages” (sec. 1.8). Why must the interpretation of words be had out of the original Languages? Because in them only the Scriptures are, for the Letter, to be held authentical. And as the Water is most pure in the Fountain or Spring thereof: so the right understanding of the words of the Holy Scriptures is most certain in the Original Tongues of Hebrew and Greek, in which they were first written and delivered to the Church, out of which Languages they must be truly translated for the understanding of them that have not the knowledge of those Tongues. What gather you from hence? That all Translations are to be judged, examined, and reformed according to the Text of the Ancient Hebrew and Original Chaldee, in which the Old Testament was penned, and the Greek Text, in which the New Testament was written. And consequently that the vulgar Latin Translation, approved by the Tridentine Council for the only Authentical Text, is no further to be received of true Christians, than it agreeth with the Original of the Hebrew and Greek Text. I was very sorry to hear via an announcement on the Papy-L discussion list that Walter E.H. Cockle has passed away on 6 December 2018. I first met Walter at the Fifth Birmingham Colloquium of Textual Criticism in 2007 where I presented a paper (and he was chairing the session). I then met him at several successive colloquia. During these meetings I have had the pleasure of sitting next to Walter on several occasions, as in this image from the closing banquet of the seventh colloquium in 2011, where Walter is giving a smile to the photographer, Edgar Ebojo (more pics here). I always enjoyed talking to Walter, who was one of the most erudite scholars I have ever met – like a living encyclopedia, who knew his references in detail (place and year of publication, etc). He could talk at length about various historical events not only relating to antiquity for that matter. 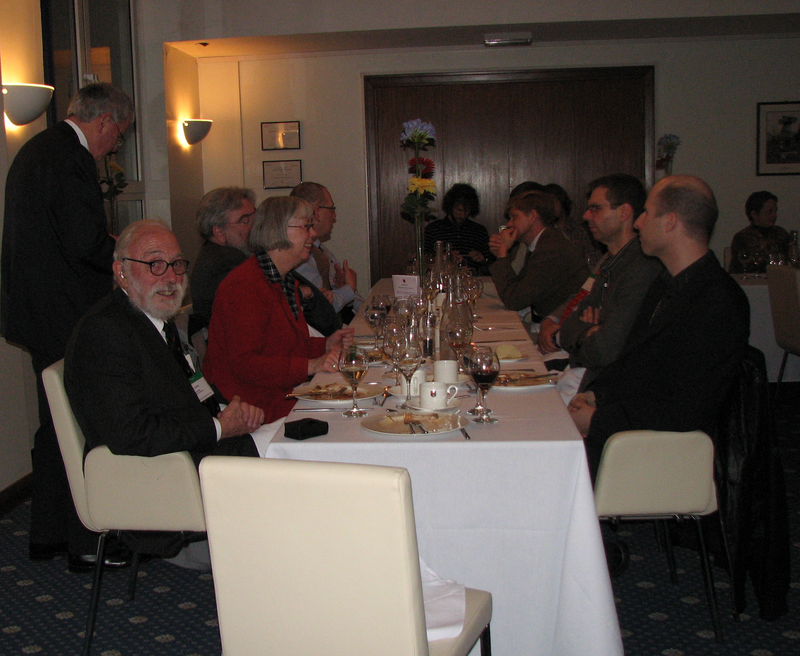 But most exciting for me was to hear about his experiences from excavations in Oxyrhynchus. 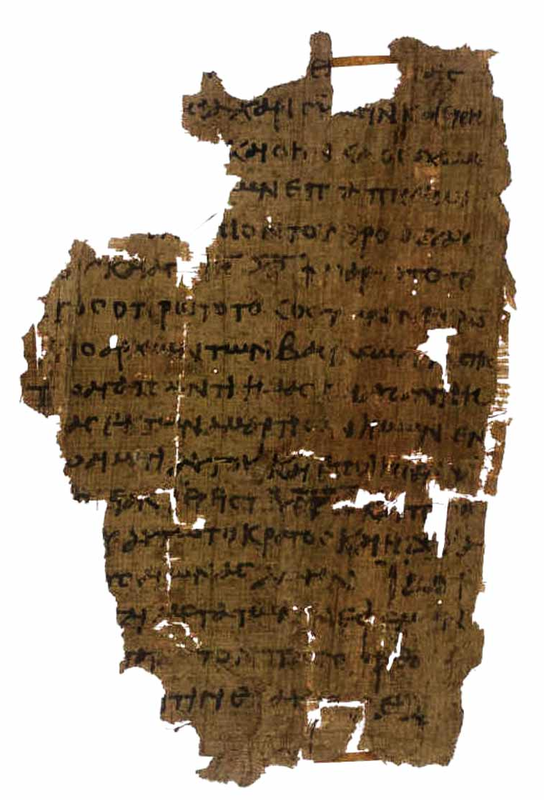 Walter also edited several New Testament papyri and an uncial from Oxyrhynchus including P. Oxy. 4445 (P106), P.Oxy. 4446 (P107), P.Oxy. 4447 (P108) and P.Oxy 4448 (P109), all in OP LXV (1998); P.Oxy. 4494 (P110), P. Oxy 4495 (P111), P.Oxy 4496 (P112), P.Oxy. 4497 (P113), P.Oxy. 4498 (P114), P.Oxy. 4500 (0308) in OP LXVI. Is there anyone who has edited as many NT papyri as he did (I have not checked this)? Not only an excellent ancient historian, papyrologist and colleague has left us, but a very warm and kind person who will be missed by many. The funeral will be held on 21 December. We are sorry to inform you that Walter passed away, aged 79, on Thursday, 6 December after several months of illness. His funeral will take place on the Friday before Christmas, 21 December, at 1.30 pm at St Mary Magdalene, Latimer, Bucks HP5 1UG. If you want to let the family know that you’re coming, or if you need directions to the funeral, please contact Helen: helenmcockle@gmail.com, but don’t feel you have to contact them in advance. Everyone is very welcome. After the service and the burial in the churchyard, there will be tea close by in the Cheyne Room at Latimer House. Flowers are welcome if you wish, or donations - payable to the Mountain Bothies Association or the Society of Antiquaries of London – c/o James Peddle Ltd, 10 Moneyhill Parade, Uxbridge Road, Rickmansworth, WD3 7BE, tel. 01923 772013. The focus of Walter’s career in the Department of Greek and Latin at University College London (1964-2002) was work on the conservation and publication of papyri from the Oxyrhynchus collection. He published a variety of articles on the Graeco-Roman period of Egypt and a good number of texts in The Oxyrhynchus Papyri, as well as his edition of Euripides’ Hypsipyle. He participated in seven seasons of excavations from 1987 to 1993, excavating at a Roman fort and granite quarries at Mons Claudianus in the Red Sea Mountains of Egypt as a member of an international team. The experience combined his enthusiasm for the written material of the ancient Greek and Roman world with his love of life in remote and sometimes harsh environments. He was elected a Fellow of the Society of Antiquaries of London in 1987. By now, many of you will have been tired (or worse) of my yappings about Revelation manuscripts. I’m sorry, I can’t help it and, what doesn’t help matters, the text of Revelation also happens to be the main focus of my day job. Anyway, one of the disadvantages of working extensively on a single manuscript is that it’s easy to lose the sense of wider context—socio-historical, textual, material, etc. I certainly felt this way during my PhD and so, while working through my analyses of P.Beatty I did my best to get acquainted with the wider manuscript tradition, particularly its earliest strata. An off-shoot of these ancillary investigations was an extended seminar paper I gave at the Kirchliche Hochschule Wuppertal in 2016, followed by a much more condensed SBL paper last year. Especially in the latter, I tried to address some socio-historical claims that have been made concerning the papyri* of Revelation (individually and as a group). My main purpose, however, was to bring the evidence under fresh scrutiny and provide a general overview. 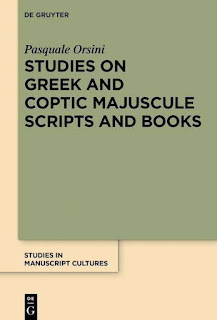 I’m happy to report that a revised version of the paper has just been published and I’m told it works magic if you have problems with insomnia: ‘The Greek Text of Revelation in Late Antique Egypt: Materials, Texts, and Social History’, ZAC 22 (2019) 400–21. *Note that ‘papyri’ here is taken in the broader sense as used by papyrologists, thus including texts written on other materials as well. Last month, Anthony Ferguson (recent PhD graduate from Southern Baptist Theological Seminary) successfully defended his doctoral thesis entitled “A Comparison of the Non-Aligned Texts of Qumran to the Masoretic Text.” Russel Fuller, Peter Gentry, and Terry Betts were on his committee, and Emanuel Tov served as the external examiner of the thesis. [A]s [texts] exhibiting the greatest amount of diversity because they are inconsistent in their agreement with the MT, LXX, and Samaritan Pentateuch while preserving unique readings (p. 1). 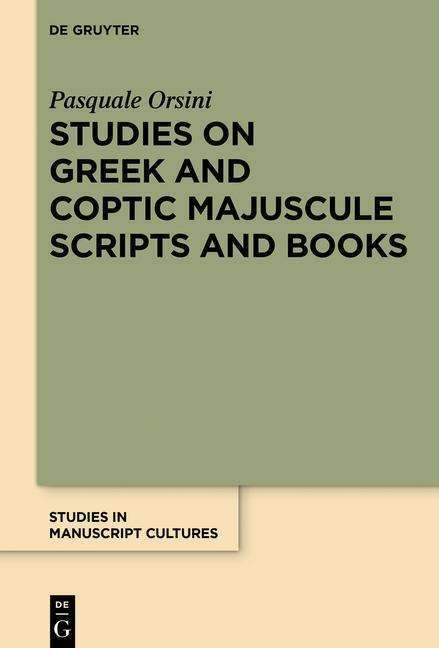 I’d like to draw attention ever so briefly to Pasquale Orsini’s excellent Studies on Greek and Coptic Majuscule Scripts and Books, published last month by De Gruyter (Studies in Manuscript Cultures 15). Many readers of our blog will have been familiar with Orsini’s prowess in the thorny discipline of palaeography, particularly due to his oft-cited article concerning the dating of New Testament Manuscripts, co-authored with Willy Clarysse. Furthermore, we were also honoured to publish his guest post (‘Palaeographic Method, Comparison and Dating: Considerations for an Updated Discussion [Guest post by Pasquale Orsini]’) where he responded to some recent proposals concerning the dating of the Bodmer Papyri. In this volume, Orsini brings together seven specialised studies—originally published in Italian, now in English translation—along with a concise methodologically-geared introduction as well as a helpful (though perhaps too brief) glossary of palaeographical terms. The essays concern a wide variety of subjects: (1) The Scripts of the Nag Hammadi Codices, (2) The Scripts of the Bodmer Papyri, (3) Greek Biblical Majuscule, (4) Coptic Biblical Majuscule,  (5) Sloping Pointed Majuscule , (6) Liturgical Majuscule, (7) Decorated Liturgical Majuscule . It is unsurprising that the essays are strong in content, given that Orsini represents the best of the Italian palaeographical tradition. Although not everyone is convinced by this school’s emphasis on stylistic typology, I for one appreciate its inductive nature, focus on the materials, and methodological sophistication. The influence of Guglielmo Cavallo, Orsini’s erstwhile teacher, is perceptible throughout, but the book is by no means derivative. At various places, particularly in the chapter on the biblical majuscule, Orsini refines Cavallo’s findings and takes them even further. In particular, the problem of geographical distribution of hands certainly needs further scrutiny and I hope that the impetus provided by this book will lead to further investigations. One could go on. Finally, I should note that the book is an Open Access publication and hence free to download from De Gruyter website. And now, a little paraenesis: tolle lege! In the latest Puritan Reformed Journal, Jeffrey Riddle has a review of the THGNT which he has uploaded to Academia. I believe Jeff is a proponent of either the Majority Text or the Received Text (not sure which exactly) and that pokes through at various points, notably in this latest sentence: “Despite all the scholarly erudition reflected in this work, however, the question remains as to whether modern text critical methodology will ever be able to offer a scholarly approximation of the text.” It’s pretty clear that Jeff’s answer to that question would be no. But the review is quite fair and evenhanded. For more on his view of the THGNT, he has a podcast episode on it here. In the final analysis, the THGNT is a visually attractive printed edition of the Greek New Testament. It is inspired by the text-critical approach of Tregelles and focuses on the earliest extant Greek manuscripts of the New Testament (papyri and uncials). 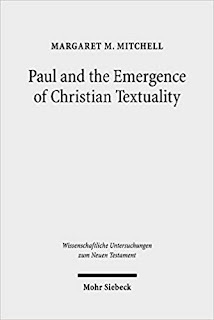 It reflects the modern “reconstructionist” method of text criticism, which emerged in the nineteenth century and eventually led to the toppling of the Textus Receptus as the standard text among most Protestants including evangelicals. It also departs at points, however, from the current trends manifest in the application of the Coherence-Based Genealogical Method (CBGM) in the Editio Critica Maior and in the most recent critical handbooks produced by the Institute für Neutestamentliche Textforschung in Münster and the United Bible Societies. As noted, this reflects an effort “to constrain editorial choice” as “a check on editorial fallibility and eccentricity” (505) and appears to be in keeping with a long history of both Anglo adaptation and dissent from German higher criticism. I don’t know if Dirk and the Petes saw themselves as dissenting from German higher criticism or not, but there we are. Although I’m not sure I’d call Revelation a ‘scroll-prominent book’ (it does involve a comparatively higher proportion of papyri, the numbers are so small that it’s very hard to make any convincing generalisations), I think the main force of Goranson’s argument lies in the fact that the beginning followed by the ending of another work in a fragment like this would speak in favour of a re-used roll. To this I might add that portions of the roll closer to the centre (i.e. ending of the → side) are more likely to get preserved than outer parts—for obvious reasons. This would fit nicely with the situation in P18, provided that the roll wasn’t rolled up the opposite way upon re-use. Here I must confess that I don’t really know how this was done or whether there are any studies that deal with this. I would thus gladly echo Brent’s observation that ‘we really do need a thorough survey of reused rolls’. I couldn’t agree more. How’s that for a doctoral thesis topic? This article has been updated (additions/substitutions in italics). In 2009 Peter Head wrote a short piece on this blog about the Artemidorus Papyrus. There has been an endless debate over the authenticity of this manuscript, purportedly a work by the first-century BCE geographer Artemidorus, which was purchased in the early 2000s by an Italian foundation related to a bank group for an unbelievable price of nearly 2.750.000 EUROS ($3,369,850). The papyrus was exhibited in 2006 and then published in 2008 as Il Papiro di Artemidoro by an Italian group of scholars. However, a professor from Bari, Luciano Canfora argued at a very early stage that it was a modern forgery, possibly by the infamous 19th century forger Constantin Simonides. So, there are two camps among scholars, one defending its authenticity, one arguing that it is a fake. 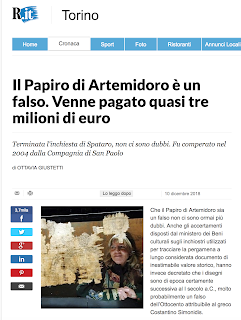 Now, the manuscript has surfaced in the news again, in Italian newspapers (here, for example), suggesting that the case is closed – the manuscript has been proven a forgery. What is this fuss about? 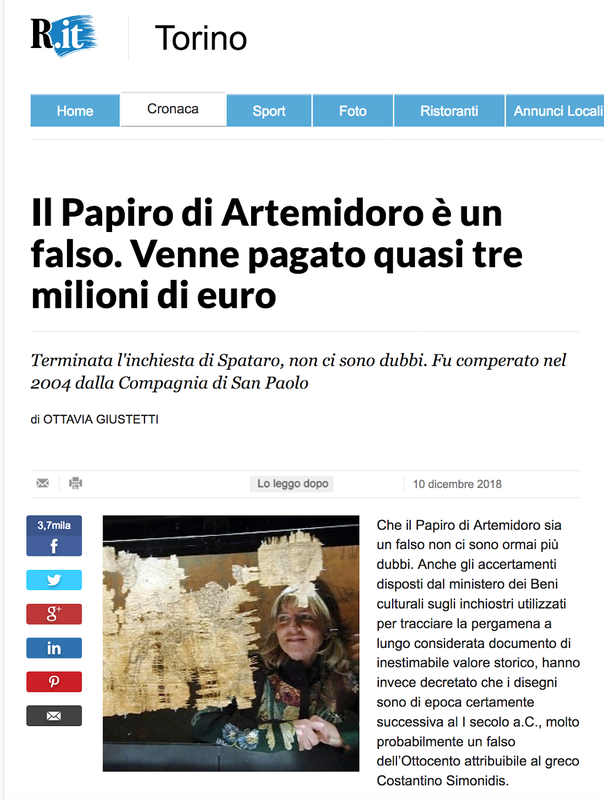 Apparently, there has been a legal investigation and the prosecuting side, the Turin Public Prosecutor’s Office has confirmed that the papyrus is a forgery, based on investigations arranged by the Ministry of Cultural Heritage (Ministero dei Beni Culturali). Well, who did the prosecutors call in as expert? Answer: Luciano Canfora & co, the one side that has argued for a forgery for many years. In fact, the news article repeats Canfora’s hilarious proposal that “it is most likely a 19th-century forgery attributed to the Greek Constantine Simonides.” As one who has studied Simonides’ forged papyri (yes, I have just submitted an article on the topic to a major journal), I must say that the Artemidorus papyrus is nothing like the papyri we know were forged by Simonides. I am ready to go to Italy to testify, just invite me :-). John’s Bible Version in John 19:37?